New Jersey dealers Michael Daniels, left, and Jack Daniels have so much confidence in Porsche they built a 36,000-square-foot store, the country's largest Porsche dealership. The 20,000-square-foot showroom at Jack Daniels Motors holds 30 vehicles. Jack Daniels' name recognition doesn't hurt, either. Car dealer Jack Daniels IV is used to seeing the grins on people's faces when they hear his name. And he's OK with it. "People have said, 'It's my favorite drink, so I thought I'd buy a car from you,' " says Daniels, who last month opened the largest Porsche dealership in America. No, he's not related to the famed 19th-century Tennessee distiller. But he doesn't mind if the famous moniker helps attract customers to the $5 million, 36,000-square-foot Porsche dealership he opened April 1 in affluent Upper Saddle River, N.J.
Jack Daniels Motors is massive -- for a Porsche store. Sitting on a hill, "the building almost looks like the Parthenon at the Acropolis," says Daniels, 55. The property includes a 20,000-square-foot showroom that can hold 30 vehicles. Porsche Cars North America says its average U.S. showroom measures 3,600 square feet. In addition, there is a 16,000-square-foot service area with 20 bays just steps away from the showroom. Outside is room for displaying an additional 80 vehicles. Daniels and his brother, Michael, 53, consolidated two Porsche stores at the new location -- the family's store in nearby Paramus, N.J., and a Nanuet, N.Y., outlet they purchased in 2008. The Daniels brothers aim to sell 500 new Porsches this year, up from about 240 last year at the Paramus and Nanuet stores combined. Last month, Daniels says, the new dealership ranked 21st in sales out of Porsche's 199 U.S. dealerships. But he expects to be in the top five by the end of the year -- and keep growing from there. Porsche executives are confident, too. "This all-new dealership is incredible in every respect," said Detlev von Platen, CEO of Porsche Cars North America. "It shows the dedication Jack and Michael Daniels have for our brand. The magnitude of the investment puts the Porsche brand on the map in a very dramatic and passionate way in one of our most important markets." Daniels bought Prestige Porsche of Nanuet for $4 million in the fall of 2008 and ran it as Jack Daniels Porsche of Nanuet until the new dealership in New Jersey was finished. The new store draws from a pair of well-to-do communities in adjoining states: northern New Jersey and Rockland County, N.Y. Upper Saddle River is a well known address of the rich and famous, such as former President Richard Nixon and ex-New York Giants quarterback Phil Simms, who is a Daniels customer. "Taking these two markets and consolidating them into one regional location allows us to draw from both markets," says Daniels. "The traffic count has almost doubled in the new facility." The area has long been a luxury-brand bastion. But Daniels says his evaluation of local vehicle registrations suggests that Porsche still has plenty of growth potential. He bases his confidence on the brand's four-door, four-seat Panamera sedan, which debuted last fall, and the redesigned Cayenne SUV, which goes on sale this summer. Says Daniels: "Porsche is intuitive enough to keep looking at products in other segments and saying 'we can do that' without diluting the product line and still staying true to the Porsche mission." Daniel's father, Jack Daniels III, opened the family's first dealership, Jack Daniels Porsche-Audi, in nearby Fairlawn, N.J., in 1972. Jack III had worked for Ford Motor Co. in a regional New Jersey sales office and later was a sales manager for the New Jersey and New York distributor for Volkswagen, Porsche and Audi. A VW franchise was added next door to the Porsche-Audi store in 1992. The family operated the original Porsche-Audi dealership until 2000, the year Jack Daniels III died. The brothers, who already were running the family business, wanted to grow in New Jersey and expand into nearby New York. As business grew, Audi remained in the original building, and Porsche moved into a larger store in nearby Paramus. 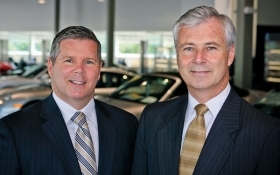 Today the Daniels brothers operate two Audi dealerships and one VW store in addition to the new Porsche dealership, all within a 15-mile area. Last year, they sold about 1,700 new Audis and 900 new VWs. Just before the father's first dealership opened, Daniels says, a representative from the whiskey maker came in to check "that we weren't selling booze." The distiller even sent the dealership a display with barrels, tubs and its logo. It sat in the rear of the store for several years. "Somehow I don't think we could do that today -- drinking and driving don't go together too well," Daniels says. "But we do benefit from the name association." And what do the automakers think? "They had no problems with the dealership name," he said, "as long as we don't sell whiskey."